A: I agree that conditioning on dry /dirty hair is odd but for slightly different reasons. Conditioners work mainly on the outside of hair - smoothing the cuticle, softening hair and temporarily mending cracks or flaws. In order to do this work, the ideal condition is that surface of hair is clean i.e oil and dirt attached to the oil is removed first with shampoo. I guess that some people are just looking for a small midweek softening boost so do not see any harm in not cleaning hair first. As long as shampoo features at the next wash, build up should be kept to a minimum. I've always been confused by deep conditioning on dirty hair too. I shampoo and then DC. Only time I DC before I shampoo is if I'm trying to get out some major tangles to aid in detangling! The reason why many African Americans use so much product is because our hair drinks it up or it evaporates and our hair is dry again in a few days. So it could be that when the person applies the deep conditioner on "dirty" hair, that the hair is ready to take on the benefit because the products are no longer present on the hair. If this were not the case, many of us wouldn't need to moisturize so much. No I have to disagree with you. 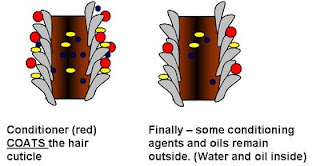 Hair can only take in a few things and many of the surfactants are simply too large to go inside in the first place. The concept of 'drinking up' is totally wrong. If anything lack of moisture is more because the water inside of the shaft is being lost. I actually think many black women are just afraid of hair feeling dry. It is entirely possible to moisturise just once a week for many if not most women and this can be just a weekly wash. Yes I think it is a co-wash of sorts. I think I have always wondered why do it on dry hair? How about washing your hair right after a deep condition. I usually apply coconut oil or Greek yoghurt and sit under the hair steamer for about 30min. After that I follow with washing with a clay based shampoo. Am I doing it backwards in terms of benefit to the hair? If you were using a regular water based shampoo with surfactants I would say that is definitely the wrong order. The way clay shampoos clean is not researched but as far as I know, they do not contain surfactants so the chances of raising the cuticle is small to none. Additionally some people report being able to use a clay shampoo only without a conditioner and end up with smooth hair. So in your case I would say that you are fine. I do DC on dry/damp dirty hair for my youngest daughter who is 2 and very busy....so I do it mainly for time sake and it seems to work fine! But as she gets older and more tolerable of getting her hair done, I'll begin to make the transition to DC after cleansing. However, I do like how the hair feels more after the co-wash vs the DC...so if the results seem better on dry hair, I'll just continue to do it that way. I do the same for my 3 yr old for the same reason and it seems to work as well. Hi JC! So what about using coconut oil on dirty hair? I'm transitioning and I usually treat my hair daily with a silicone containing moisturizer (Elasta QP Olive & Mango butter) and oil (usually coconut sometimes olive, argan or jojoba oil). I do this not just for hydration but mainly to provide extra protection to my vulnerable relaxed ends. At the end of the week I "prepoo" with a generous amount of coconut oil either overnight or for a few hours (including 10 minutes with heat) before I shampoo. Will the coconut oil be able to penetrate my hair given the buildup of my daily products? Coconut oil or any other oil is fine to use on dry hair prior to washing or on its own. I am referring to a regular water based hair conditioner in this post. The Aubrey line of conditioners frequently recommend using on dry hair for 15 minutes as a way of deep conditioning. They do however recommend to shampoo and condition hair afterwards so I am not certain the reasoning behind the treatment. Do you think this is a way of softening and preparing the hair for the actual washing and conditioning process or just a sneaky way of getting the consumer to use more product? I feel like there has to be more to this. Because I have been natural for a couple of years and usually I go through a wash, deep condition or hot oil treatment then wash off routine. However, 2 weeks ago, I had gotten off a nightshift at work and was so tired, I had just unraveled mini twists and decided to try to use my deep conditioner to detangle my hair for the most slip. After the application, i was so tired, i took a nap. When i woke up i found that my hair was unbelievably soft and i had inadvertently deep conditioned my dirty hair. I wondered if it was a fluke, but after googling, i found some naturals already do this. Thus...there must be a science to it, we should investigate further. P/S I am a type 4c so it is not like i had soft, silky hair at baseline. There is a theory I learned on yt that dry hair absorbs the products when it is dry because the hair is not absorbed with water from the wash there is more room in the strand for the product hence a better condition. I understand the dirty hair part so I wash t shirt dry air dry and then deep condition. Jc, I am so looking forward to your updated "deep conditioning myths" article for Monday. Since my natural journey started last year, I have always been a proponent of deep conditioners of all types (moisture-based, protein-based, hot oil and ayurvedic). I find that deep conditioners make a big difference for my hair. Anytime my hair is not feeling or behaving as I would like, I analyze the issue, do a deep treatment of choice, and virtually every single time, my hair's condition is improved. As I have a lot of experience with deep conditioning, I agree with MPB that I have found that deep conditioning on dry hair, often overnight, is the best method for me. It's a lot less fuss (and hygral fatigue!) than the shampoo-deep condition-rinse off process. You are only wetting your hair once instead of twice. Also, my hair feels better when I deep condition overnight on dry, dirty hair. I used to be afraid of over-moisturizing, but I have not ever had this issue. I live in a semi-arid climate (Colorado), and I am at the point where I have started dry deep conditioning overnight twice a week, and my hair is so much easier to maintain daily. I used to have to re-moisturize up to twice a day with various creams and oils, and now I don't have to moisturize between hair washing sessions at all. To reiterate, I believe the reason I don't suffer from overmoisturization of my hair from these twice-a-week deep conditioning sessions is 1) I switch them up (moisture one day, a clay mask or hot oil treatment the next time); and 2) I live in a dry climate. I also have longish hair (15 in), so my ends are old and need as much help as they can get. Everyone will have to experiment and find what's best for them, given their hair type, environment, porosity and hair length. I actually deep condition my hair before I wash it (after misting it with water) and I never had a problem with it. My DC helps me finger detangle my hair and shortens my wash day dramatically. Then again, I wash my hair once a week, some times twice, so my hair never seriously gets dirty. I actually loovveee deep conditioning on dry hair. I use the macadamia deep repair masque:) I wash my hair at night using a cleansing shampoo and regular light conditioner I dont add a serum or leave in, sleep on it and let it dry naturally. The next morning when its dry I section off my hair and apply the masque/deep conditioner. I put a shower cap on and leave in in for a few hours and when I rinse my hair and let it dry it never looks more beautiful! Ih find I can go longer not washing it and it stays hydrated longer so I dont need to use heat everyday.